Disclosure: I was provided complimentary tickets to the festival on behalf of this coverage. 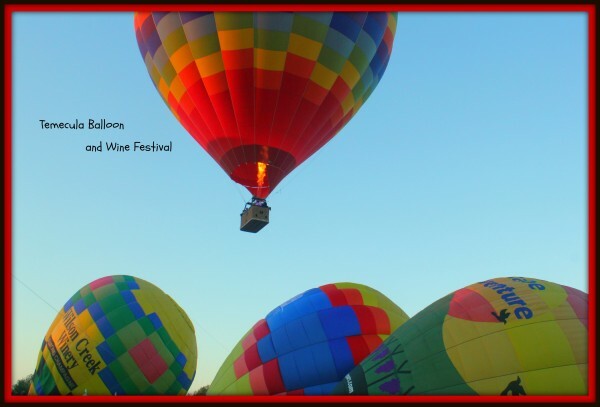 Last weekend was the 30th Annual Temecula Balloon and Wine Festival. I had first heard of this festival when I moved out here 2 1/2 years ago, and wanted to go ever since I heard about it. I wanted to go to shoot the balloons with my camera. Unfortunately, the dates never seemed to work out. In the future, mark the first weekend of June off in your calendars if you want to attend this beaut of a festival. So, on Sunday morning, I woke up at 3:30am, got dressed, grabbed my camera gear and got in my car, and drove almost 2 hours down to Temecula. To me, capturing the sunrise as I drove in through the hills of the valley made the two hour trek completely worth it, however, I knew it was only going to get better. The festival takes place on the grounds of Lake Skinner Recreational Park. Doors open at 6am, and right away crews get going on the balloons. If you want to ride in one you can purchase your tickets ahead of time for the festival. Costs 200 dollars to ride a balloon. The flights include a champagne toast. It wasn’t long before the first balloon took flight. Many soon joined in after, and remained in the sky for the next hour and a half afterwards. That day, the breezes were pretty light, so, for a photographer, made for GREAT shots. A lot of the balloons were even able to land right where they launched from. Many said this was one of the BEST mornings the festival had had in a long time. This was one of my favorite shots from the morning where the first balloon was in flight while 3 others were getting blown up below. 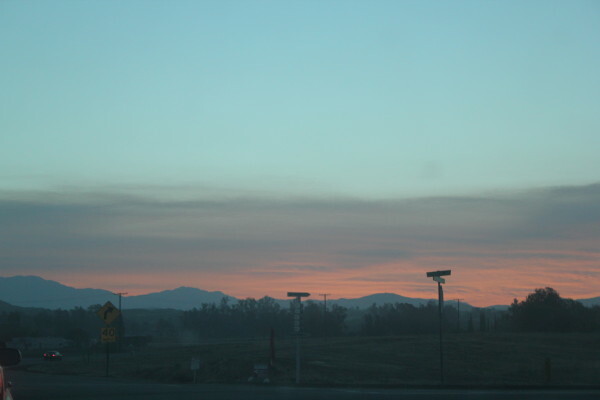 Another great shot of the variety of balloons that were in that sky that morning. They stayed in the sky pretty steadily above the festival grounds this year. At one point you could turn in every direction and there were more right above you, to your left, or to your right. Tethered balloon rides were also available starting about 8am. These rides would take you up in the air by the balloon while being tied down so you could get a genuine feel of what it was like to be in a Hot Air Balloon. 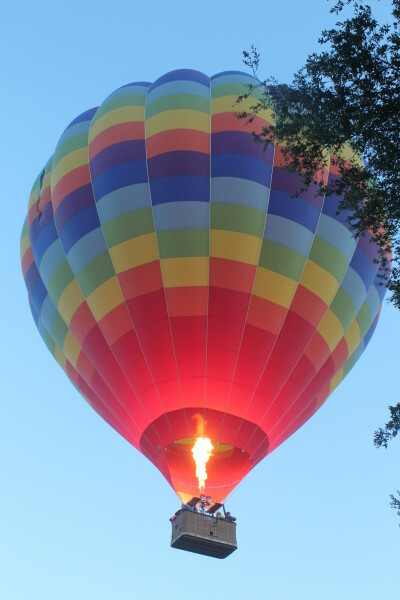 However, the balloon rides could only go on for 90 minutes or until they ran out of propane. Between 9am and 11am, the vendors came into the festival grounds to begin setting up their booths, and the food vendors began to open their doors. Some were even serving breakfast for those that love their pancakes and sausage. And the wine tasting began to happen around 11am. 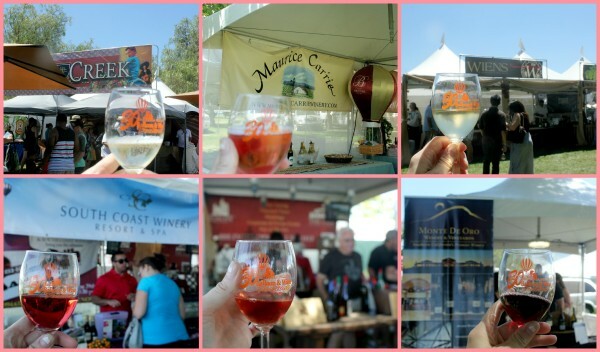 Local wineries from the Temecula area set up booths and brought in their local wines for you to taste. You could purchase 6 tastings for 15 dollars and keep the wine glass afterwards. The wineries change out each year. This year the wineries present included: Briar Rose, Europa Village, Lorimar, Maurice Car’rie, Monte de Oro, Orange Coast, Robert Renzoni, South Coast, Thornton, Van Roekel, Wiens Family Cellars, Wilson Creek, and Canyon Crest Wineries. For myself I tried out Wilson Creek, South Coast, Wiens Family Cellars, Europa Village, Monte de Oro, and Maurice Car’rie, and was very much in my happy place during this time. Vendors present included hat companies, wine vendors selling various wine gear, food vendors from bbq to popcorn to even wine bbq’s and jellies to a vendor selling beautiful handcrafted balloons and jewelry. On Friday and Saturday there was live music entertainment including Scott McCreery, Easton Corbin for Friday evening. On Saturday rock stars Eve 6 and The All-American Rejects and Berlin were present. And that was just them warming up. It was a fun weekend of balloons, wine, and entertainment. If you haven’t been before it’s definitely worth the trek down there to experience, but yes, you have to wake up early although there are campsites available during the entire weekend to rent out. 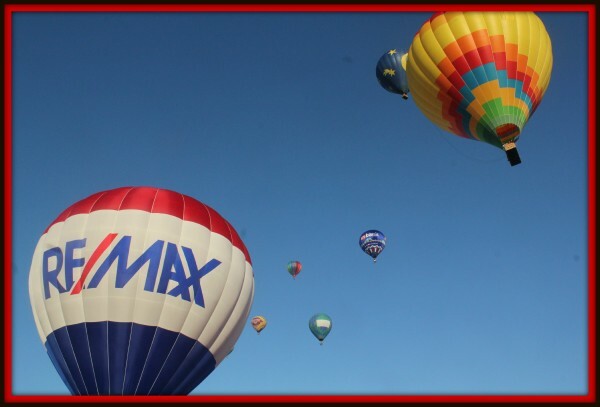 Disclosure: I was provided complimentary tickets to the Temecula Balloon and Wine Festival on behalf of this review.